About "Martin Luther as Prophet, Teacher, and Hero (Texts & Studies In Reformation & Post-reformation Thought Series)"
This work considers the ways in which Martin Luther's contemporaries and successors used his influence in the German Reformation and adapted it to the needs of the church in their respective ages. 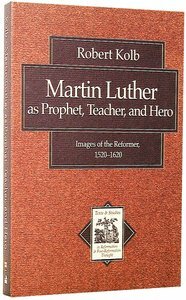 Robert Kolb suggests Luther's disciples viewed him in three different ways: as prophet, teacher, and hero. The second section of the book focuses on the use and collection of Luther's writings. Explores Calvin's theology of the Psalms, arguing that Calvin's biblical interpretation is fundamentally shaped by his doctrine of God. In this intriguing book, Herman Selderhuis argues that John Calvin's biblical interpretation of the Psalms is fundamentally shaped by his doctrine of God. Selderhuis minimizes references to other Calvin studies and other works by Calvin, thus allowing Calvin's theology on the Psalms to speak for itself. The book is organized thematically according to divine attributes. Reformation and Calvin scholars as well as interested Reformed readers will value this resource. Herman Selderhuis (Dr.Theol., Apeldoorn) is professor of church history and church polity at the Theologische Universiteit Apeldoorn in the Netherlands. The author of several articles and books on the Reformation, he is also director of the Institute for Reformation Research (Apeldoorn) and is general secretary of the International Calvin Congress.